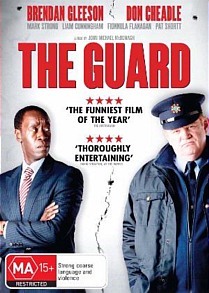 The Guard DVD Review The end result is smart, self-aware and endlessly funny, a fact made all the more remarkable considering it’s the feature-length debut from writer/director John Michael McDonagh. Boasting one of the more unlikely on-screen pairings of recent memory, The Guard is an odd couple buddy cop comedy of the highest calibre. The most successful independent Irish film ever in terms of box office receipts, according to the hallowed source that is Wikipedia, the film sees chameleonic Emerald Isle star Brendan Gleeson (of Braveheart, In Bruges and Harry Potter fame) starring as quite possibly the most curmudgeonly small-town police officer of all time. While investigating the crimes of a possible serial killer, in between indulging in world-weary tirades and insulting all those around him, he’s forced to interact with an FBI agent sent to Ireland in order to assist with the case (Don Cheadle, Hotel Rwanda, Iron Man 2). Together the pair form an unlikely alliance of sorts, and the end result is one of the most brilliant and hilarious black comedies of the century. Admittedly we’re only 12 years into said century, but this shouldn’t detract from the film in the slightest. Unanimously acclaimed by audiences and critics alike, The Guard is a masterwork of sly wit and fast-paced action. The veteran Gleeson commands the screen with apparent ease, relishing his role as unorthodox anti-hero and playing skilfully off his equally accomplished American counterpart. The end result is smart, self-aware and endlessly funny, a fact made all the more remarkable considering it’s the feature-length debut from writer/director John Michael McDonagh. Heartily recommended, to be sure. Paramount and Transmission Films have done a top-notch job on the home media release of The Guard, and bolstering the film itself are a host of truly worthwhile bonus features. These include an Audio Commentary with McDonagh, Gleeson and Cheadle; a Behind the Scenes Featurette (18:30); no less than 25 minutes of Deleted and Extended Scenes; several minutes of Outtakes and McDonagh’s 2000 short film Second Death.